Take this opportunity and get to know some of the most emblematic places of Lisbon in this private walking tour, with your private tour guide, who will show you and illuminate you with the best spots, history and culture of this fantastic city. You will visit Baixa, the heart of the city, Chiado, which used to be the place where the writers and intellectuals gathered, and Bairro Alto, the area where most of the restaurants and the where the nightlife happens. This tour is completely adjustable to what you want to see in Lisbon, please don’t hesitate in contacting us. Enjoy as much as possible your time in Lisbon and enjoy this half day private walking tour through some of the most emblematic Lisbon’s quartiers. You will get to know the heart of the city, Baixa, where most of the everyday and most important things happens, Chiado and Bairro Alto, which are the most artistic and bohemian neighbourhoods of the city. This private tour will start at the D. Maria 2nd Theater, at the time desired by you. It is possible to start the tour in your hotel or place of choice, if it is on a walking distance from this starting point. The Tour Travel and More team will help you to organize the tour the best possible way to fit your own interest and likes. Remember that this tour is completely adaptable to your interests, as it is private and only for you and your travelling partners. This private walking tour will kick off in front of D. Maria 2nd Theater, next to the plaza del Rossio, the main square of the city. Your private guide will show you Baixa, which is the neighbourhood that represents the heart of Lisbon. When Lisbon suffered a earthquake in the year 1755, this area was completely devastated, so it had to be restored by Marquis de Pombal, who re builded the whole area with bigger streets than the ones before, and many more open spaces. He developed a new anti seismic way of constructing which was new for the time. Many architectural styles are represented, including the unique neo gothic style of Mesnier du Ponsard. You will arrive to the plaça do comercio, the biggest square in the whole city, which has a open view to the Tagus river. This location was traditional where traders would sell their foreign wares and financiers would fund perilous expeditions to the far reaches of the known world. After visiting the plaça, you will continue your tour in direction to Chiado. Chiado is the popular shopping and theatre district of Lisbon, which has a selection of historic monuments, tradition shops and interesting cafes and restaurants. This neighbourhood used to be the home for the intellectuals, writers and poets, of Lisbon. 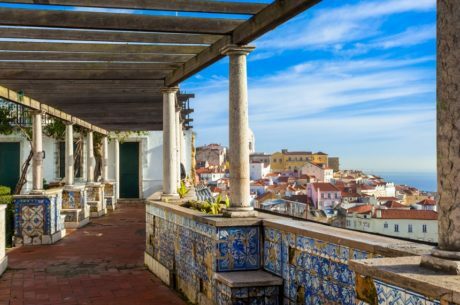 You will walk around the beautiful streets of Chiado, while your tour guide tells you the history of this stylish quartier, until you arrive to Bairro Alto. Bairro Alto is known to be the neighbourhood with the best nightlife in the city. During the day, this area is pretty quiet, and it is one of the best areas of the city to go for lunch or dinner, it hosts a wide variety of restaurants and bars. 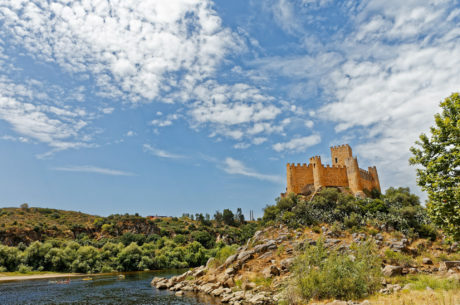 One of its best point is the Miradouro San Pedro de Alcantara. 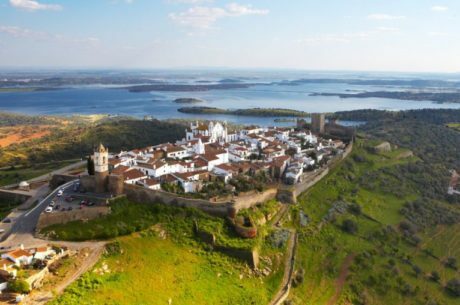 This viewpoint is located in the west of the city, and it has a very wide garden, where you will enjoy a stunning view of the city of Lisbon, Saint George´s castle and the Tagus river.